The SAES Getters Oxygen Dispensers are designed to introduce calibrated quantities of Oxygen into the interior atmosphere of the lamp jacket this to prevent blackening of the discharge tube that may be caused by carbon deposits originating from hydrocarbon residue inside the jacket. Residual hydrocarbon residing in the interior of the lamp may be cracked and reduced into carbon by the energy released by the burner, resulting in the formation of a thin layer of carbon deposits on the surface. Our Oxygen Dispenser intentionally releases calibrated quantities of oxygen so that the carbon is converted to gaseous carbon monoxide or carbon dioxide before they are deposited on the burner surface. The combined use of getters such as the SAES Getters St101 or St777P allows the effective and permanent removal the oxidized gases and excess oxygen released from the Dispenser, thus ensuring long-term quality and reliability of the lamp. 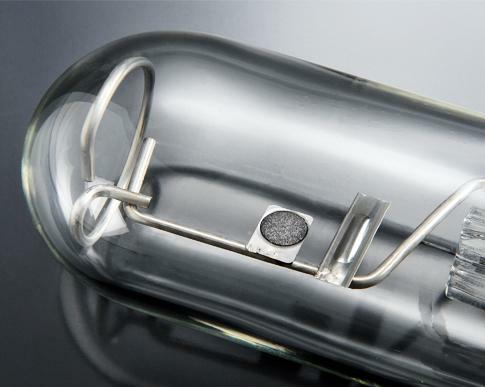 Any discharge lamps that exhibit blackening due to carbon deposit caused by cracking of hydrocarbons inside the lamp. FOR MORE PRODUCTS INFORMATION, PLEASE CLICK ON "CONTACT US" AND FILL THE FORM.